LISTEN NOW! In a recent gathering for the National Day of Prayer in Washington, D.C., there were many distinguished guests and speakers. One of these was Major General Craig Olson with the United States Air Force. 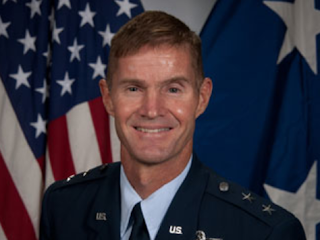 Maj. Gen. Olson shares his own story through transparent stories of journeys and travels as a Christian in his family, as a leader in America’s military, and in his relationship with Jesus Christ. It is refreshing to see a man of such stature walk in such humility. As the Maj. Gen. introduces himself to his audience, he does not begin as one would think, with stories or humor, but with gratitude and the things that he is thankful for. Maj. Gen. Olson shines the light on the many who have helped him in his life, and the testimonies of how God has guided him in each along the way. One of these is his time in the United States Air Force Academy. He still carries around his original transcripts. He learned at long ago his need to depend on those other than himself, mainly Jesus Christ. Maj. Gen. Olson continues to share from his many travels throughout the world and experiences sharing his gratitude for veterans On September 11, 2009, remembering the Twin Towers, Olson found himself in Baghdad, Iraq considering what the world would have looked like, had America never been in involved in wars like World War II, Vietnam, and the Global War on Terrorism. He shares, ‘the world would be a much different place, and a lot less free’. In addition, he is reminded of the power of the freedoms in America after interacting with the many Iraqi people. As beautiful as the words are, and the stories that Maj. Gen. Olson shares, The Air Force Times is reporting that there are those who are responding to his speech by stating, ‘Olson’s speech is “a disgrace to the very uniform he was wearing and the solemn oath he took to support and defend the United States Constitution.” Hear all of the words that Maj. Gen. Olson shared, a deeper look into how the Lord has moved in his marriage, his family, how he sees the importance of prayer in our military, how to pray for our military, the fact that the Maj. Gen. is receiving criticism for these words, and how others are asking for a Court Martial, and so much more. Greg and John shared in this segment. Public Prayer vs. Private Prayer: Why would God be more impressed and more likely to respond to a public prayer than to a private one? 1,000 Weapons Found at Waco Bike Gang shootout: Has shaming Law Enforcement caused Criminals to be More Brazen?